So there you go. The directions are pretty straight forward: leave Itaewon station exit 4 and walk straight for about 10 minutes. Once you pass the McDonalds, look on your left hand side, and you’ll see an arch saying, “Alley Market”. Walk under it, and you’ll see the Pizza Peel. 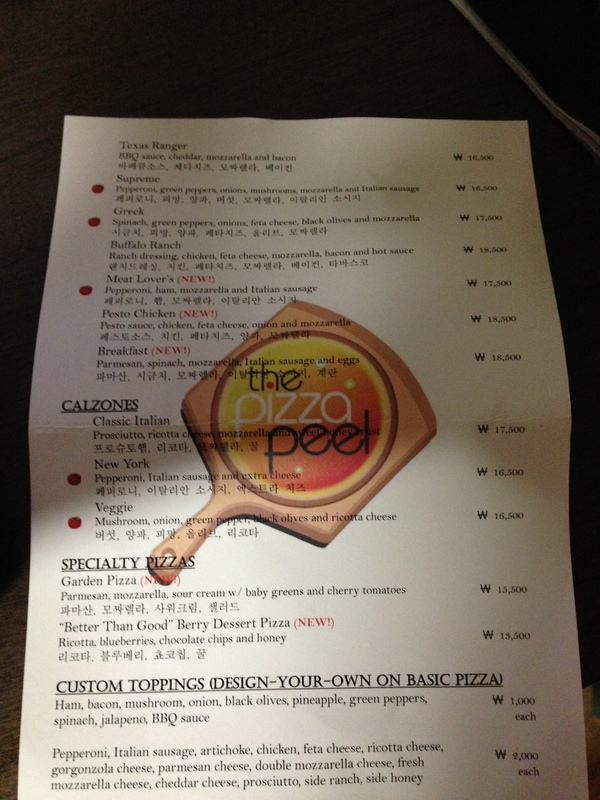 As I mentioned before, the reason that brought me here was that I heard it was the best pizza in Seoul, but then again, it seems that there are many contenders for that coveted crown. So I had to check it out for myself. 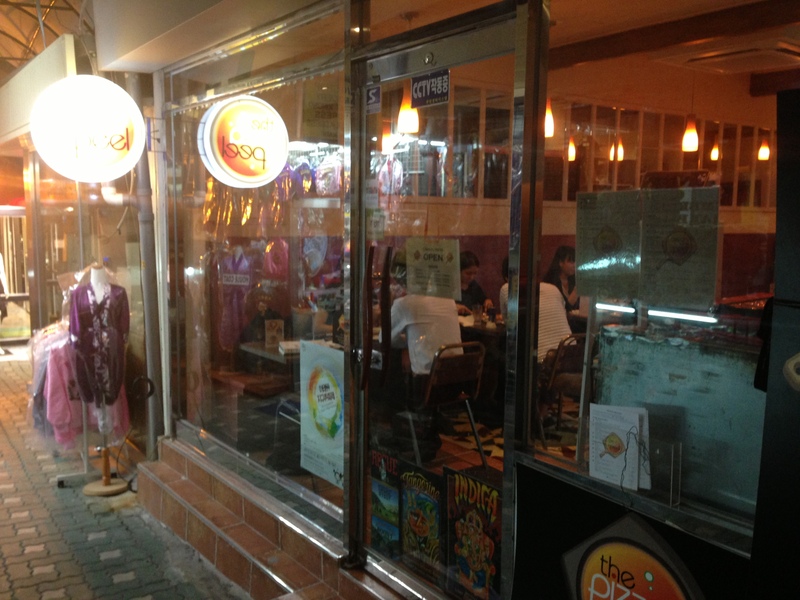 The interior was modest but very busy with people enjoying their Hangul day off from work/school. 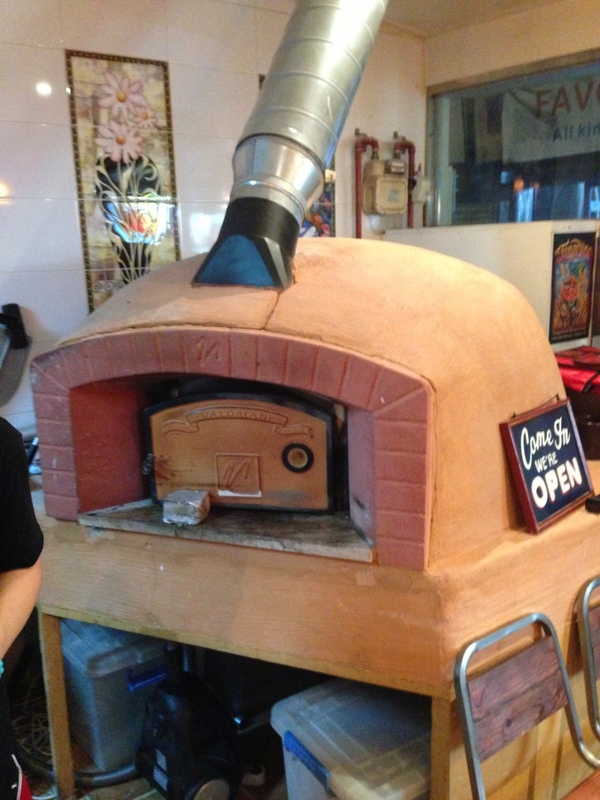 I greatly admired the establishment’s brick oven that seemed to be cut and pasted straight from a pizzeria back home, NYC, or Italy. To drink they also have soda and beer options that goes beyond the typical Korean trinity of Cafri, Cass, and Hite which was pretty great, but the non-Korean choices are in the same league as the pizza prices. However, I figured the pizza was so expensive because of the ingredients you’d never find on Korea pizzas like Feta cheese, pesto, Ricotta, and artichokes to name a few. I kind of wanted to eat them all, and I even considered one of their dessert pizzas. Sadly, I’m not making Psy money teaching English. 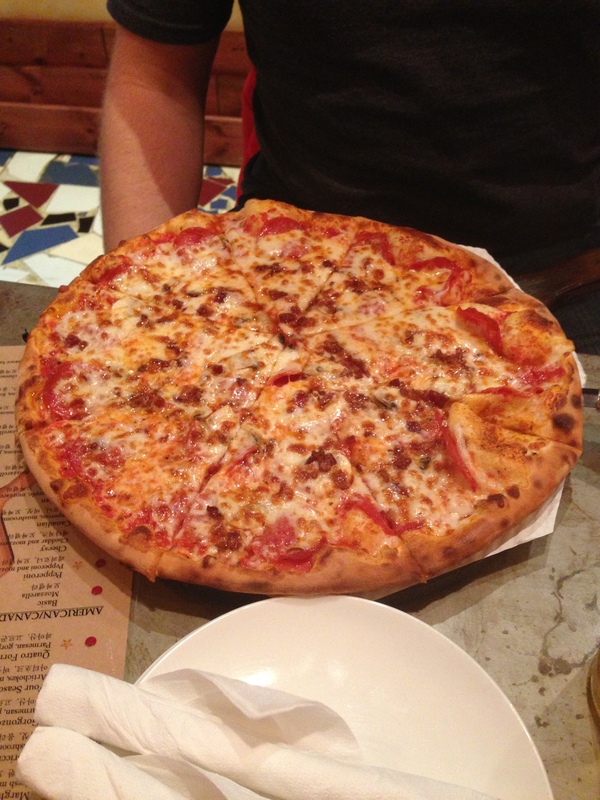 Eventually, I went for the Buffalo Ranch pizza (18,500 W), and Aaron went for the Canadian (15,500 W). Aaron’s pizza looked marvelous, and I learned that apparently in Canada they actually have their own “Canadian style” pizza which must have mushrooms, pepperoni, mozzarella, and bacon on it (not Canadian bacon though for the Hosers or peameal bacon for the Canucks). As for my pizza, it looked delectable as well. Size-wise, if you’re a big boy/eater like me or just really hungry, you can easily eat one of these pizzas by yourself which further underscores the somewhat inflated prices. In comparison to the North American fatty alliance at our table, the Koreans around us were splitting the small pies between two people. Go figure. We quickly tore into our meals, and mine was interesting to say the least. First, the crust. It was definitely on the thin side, and I dare say thinner than NYC slices which are like delicious pieces of paper with cheese on it. What this all meant was that each slice’s integrity was close to nothing, so you had to fold it in half and hope the piping hot toppings didn’t fall on your clothes/hand like some delectable napalm. I’ll take my thicker Chicago thin crust, thank you. On the other hand, the crust was expertly baked in just the right places with a golden hue and warm, white center to every crust. 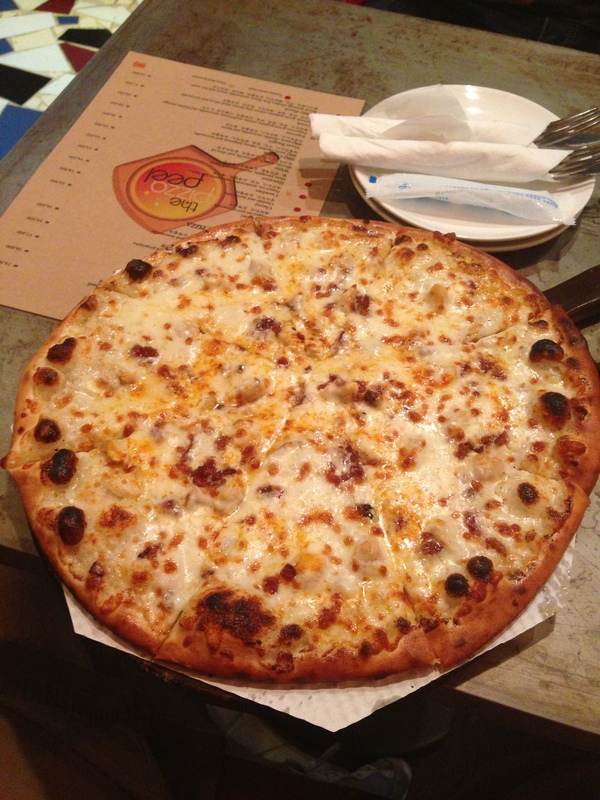 As for the toppings, there was plenty of natural mozzarella cheese instead of the typical, artificial, rubbery cheese-flavored product the Koreans use on their pizzas. The chicken chunks were well roasted and went well with the ranch dressing which was the substitute for the traditional marinara tomato sauce. It was like gobbling down pizza and chicken fingers at the same time. Ranch just goes so perfectly with both! I didn’t really taste much of the Feta or the hot sauce, but I was satisfied with my choice nevertheless. 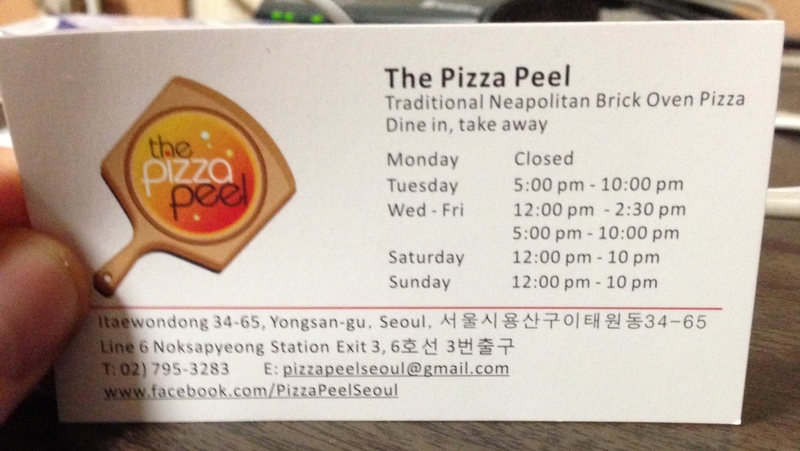 So after finally going to the supposed “Best pizza place” in Seoul, I’d have to disagree. True, they have some rarer pizza ingredients along with a brick oven for that rustic touch, but I’d still take Monster Pizza over Pizza Peel. You get one giant slice of quality pizza for only 3,000 W roughly, and a whole pizza from Monster Pizza could feed a small army for just a fraction of Pizza Peel’s prices. Now that’s something a gourmand like me can sink his teeth into. Posted in American Cuisine, Pizza and tagged bacon, Canadian, cheese, chicken, Feta, Itaewon, pizza, ranch dressing, Seoul, thin crust. Bookmark the permalink.